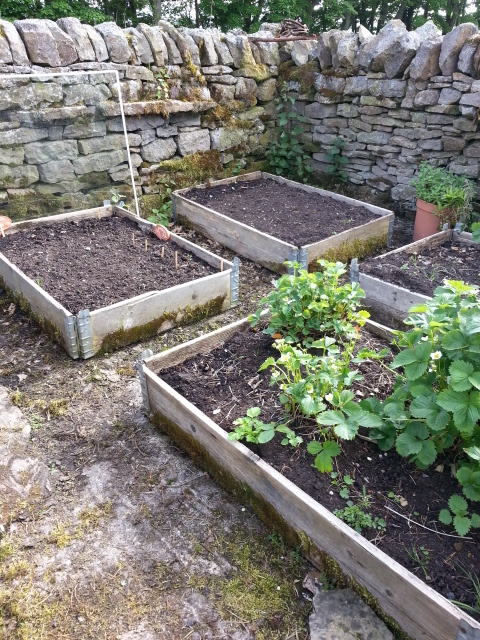 There are a couple of areas that have obviously been set aside for vegetables in the past The main veg bed must have previously been a set of raised beds but now the framing has gone so I decided to level off the soil and convert it back into a single bed divided by paths. As can be seen in the picture, the existing rhubarb (at the back) has been brought back into line with the huge flowers removed and many of the older, chunkier leaves taken off. this will be followed by a good mulching so hopefully in future this will continue to be productive. I’ve decided to keep our original rhubarb in the pots where I planted them earlier this year. Maybe I’ll move them early next year perhaps but they probably need to get established where they are this year. While on a recent trip to buy some machinery (a heavy duty strimmer), we popped into a nearby garden centre and I couldn’t resist getting a couple of trays of cabbage seedlings – one labelled as January King and the other Ruby Red I think. Maybe 2 trays of 12 plants will prove to be too many though as they are now taking up much more space than I had planned to use for cabbages! Hopefully I can squeeze in a catch crop before they get too big as I need somewhere to plant out the lettuce seedlings that are coming on so well. The peas and beetroot seeds at the back are only just starting to show signs of growth but I’m quite happy with that as the seeds have only been in for 2 weeks! In an adjacent area there are 4 raised beds left by the previous owners which I have retained but as we’ve not been here long I have no specific plan for them. 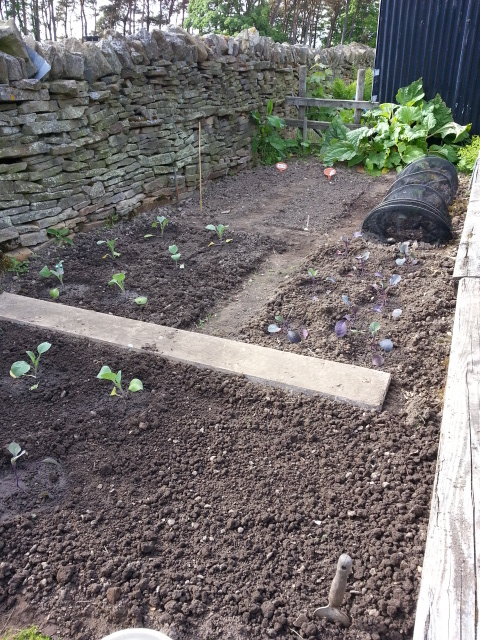 On the first weekend we got here I planted some onion, carrots and beetroot but I deliberately left a little space for the moment so I can plant some more seeds once the first batch get going. These beds also had some existing strawberry plants which are a new thing for me. In the past I haven’t been bothered about soft fruit but now I’ve got a lot more space I’m starting to think about setting aside an area and investing in a fruit cage or similar. Something for the future I think as there is more than enough to be getting with right now. Hopefully all I need is to maybe put down a little straw to keep the fruit off the damp soil and then maybe some sort of netting over the top to keep out the birds. Despite those plans, I don’t hold out a lot of hope for getting fruit from these plants as the wall around this area seems to be populated with field mice. I’ve seen a couple of them but they are hard to spot – I’m sure they’ll be hungry for strawberries at some point. The chicken shack village is made up a number of “inherited” buildings from the previous owners (in the foreground) which are towering over the low rise chicken house we brought with us when we moved here (just visible near the back). 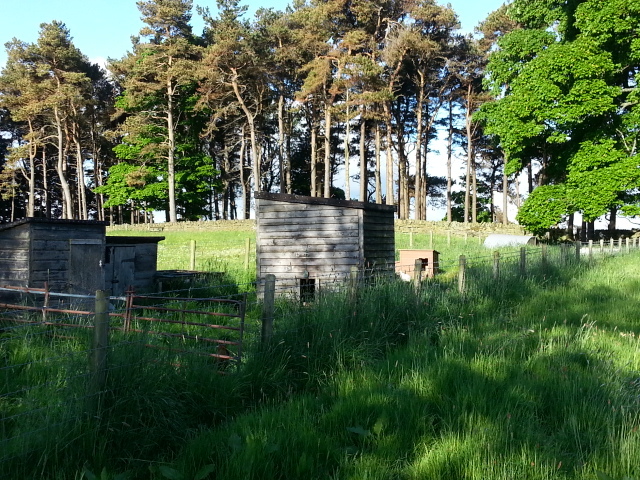 There is a main chicken house for the rooster (now known as John) and his ten lady friends – in the centre of the picture – and a couple of storage sheds on the left. One of these has a run attached which is currently home to a broody hen who has been sitting on 7 eggs for a week or two – it was eight eggs when we first got here but we think a stoat must have paid them a visit perhaps? This is all situated between the paddocks at the back so the hens are not as close to the house as we were used to but now we have a rooster as well this is not such a bad thing in my opinion! Luckily the two sets of chickens have settled into a truce where each set ignores the other apart from the occasional ruffling of feathers if there is food is involved. If anything I think it helps that our 3 hybrid hens are larger than the existing 10 hens which goes some way to compensate for the greater numbers should any disagreements arise.